AS one drives along Jalan Damansara towards the city, it is impossible to miss the blue sheets covering parts of Bukit Damansara the last 10 months. For decades, that location and the larger Damansara Heights has been one of the most upmarket residential suburbs in Kuala Lumpur. Bukit Damansara is today embroiled in a controversy with angry and fearful residents on one side and a developer on the other, in the wake of last week’s tragedy in Bukit Antarabangsa, Ulu Kelang which took four lives, injured 15 and destroyed 14 houses. 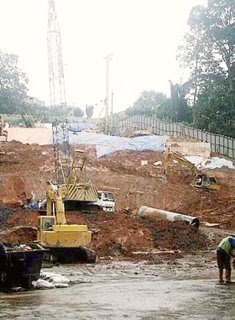 Because SDB Properties Sdn Bhd, a subsidiary of Selangor Dredging Bhd, is currently involved in two hillside developments – Damansara 21 in Bukit Damansara and 20Trees, Taman Melawati – the company has come out on record to give its view to allay fears and further controversy. Its managing director Teh Lip Kim says Damansara 21 will not suffer the same fate as Bukit Antarabangsa as long as the company’s plans to stabilise the slope continue unhindered. She also says the company will need six months to complete soil stabilisation works to make the hill safe. “To stop work now is dangerous and irresponsible. Because we are the landowner, we are responsible for this property,” she says, adding that the company has been around since the 1960s and has a reputation to uphold. Neither would we start a project if it was unsafe,” she says. The company was slapped with a stop-work order for about 10 months. Work resumed in October. The luxurious development, scheduled for launch by the second half of next year, comprises 21 multi-storey bungalows with a starting price of RM10mil each. The project will have a gross development value of RM250mil. “In today’s economic climate, it will be difficult to sell the bungalows. Yet, we are ready to spend RM30mil to strengthen the slope and ensure that the houses and surrounding areas are safe. “It would be more dangerous to abandon operations mid-way,” she says. Teh adds that upon completion of the project, SDB would be setting up a sinking fund to continue slope maintenance in the gated and guarded development. The company aims to terrace the hill and site the bungalows on flat platforms carved into the hillside. Teh says the company had complied with all the remedial and safety requirements to certify its Damansara 21 project was safe for construction. SDB group general manager Loong Ching Hong says apart from city hall, the company has also obtained approvals from 16 other departments. He adds that SBD has even been accused of bribing its way to obtain the approvals. “Is it possible to bribe 16 departments?” Loong asks, adding that the Damansara 21 project was on par with the latest engineering standards. SDB also has another hillside development, 20Trees in Taman Melawati, which comprises low-rise apartments and landed homes. To sdate, Teh says about 75% of this Melawati project has been sold. Geotechnical engineer Dr Gue See Sew, who has been extensively quoted each time a landslide occurred, says it would be the height of folly to stop work when part of the land is cleared. “To stop the developer from continuing operations to strengthen the slope is tantamount to doing an operation half way and forcing the surgeons to stop. To do nothing, when the slope is already cleared, is as bad as inviting a disaster. It is dangerous to stop now,” says Gue, adding that it is best the developer continues slope stabilisation work as speedily as possible. “Caisson piling, which is what is being done on Damansara 21, involves a hand-dug method. It is much like digging a well by hand and pouring concrete and reinforcement into the ground. “It is unlike bored piling, which uses a huge machine to drive piling into the ground like a hammer on a nail. “Caisson is a far better option for hillside development,” says Gue, who is an independent source. Country Heights Holdings Bhd CEO Datuk C. S. Ong, who has been trying for several years to turn Country Heights Damansara into another upmarket development like Damansara Heights, has discovered that his vision remains a distant dream, just as the dreams of land owners who bought that property several years ago. Of 270 bungalow plots, works have started on only 70 of them. Only half of which have been completed while the remaining 30-odd remain as work-in-progress. About 30% of the 270 vacant bungalow plots have a gradient of 26 degrees or more, some as high as 45 degrees, says Ong. He gave no reasons why the project is taking so long to materialise other than building a house on a slope is not the same as building on level ground. It takes a very brave landowner to begin construction. Not only will building on slope cost a lot more – 45% or more compared with constructing on flat ground – landowners are uncertain how to go about it because of the steepness of the slopes. Geotechnical expertise is a must, even before construction. These reports must be submitted to the authorities. Says Ong: “Architects think of aesthetics. Geotechnical engineers think of the safety of the slope and construction. There must be regular checks for unstable land conditions even as construction goes on. And when the house is build, checks and maintenance continue to be a must. “Nature will give man time to remedy. There will be signs and symptoms. The danger is when these signs are ignored,” says Ong. With the Bukit Antarabangsa tragedy still fresh on people’s minds, what are the options for landowners over at Country Heights Damansara? The price of land there is telling. If one were to buy land from the developer today, the price of vacant land is between RM250 and RM300 per sq ft.
On the secondary market, it is between RM220 and RM270 psf. “Slightly cheaper on the secondary market,” admits Ong. It looks as if Country Heights Damansara will remain green for quite a while to come. WHAT is it about hillslope developments which hold so much enchantment for some, developers and house buyers alike, and yet be the source of so much controversy and frustration? For a certain category of house buyers, the view matters. Because they are prepared to fork out loads for it, developers pander to what some may consider a mere whim. 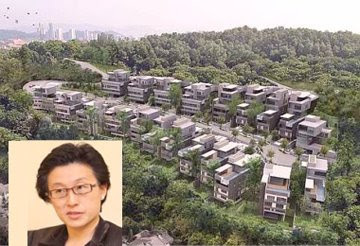 Banning all the hillside development is not the solution, says Lim. Since the Highlands Tower incident in 1993, local authorities have every now and then, “banned” hillslope developments only to quietly issue approvals for hill projects. The issue is not the fickleness of man in positions of authority and power, but the concerted willpower to monitor and maintain. Lim says houses and high-rise are built on steeper slopes in Hong Kong, the Mediterranean coast line, the United States and other parts of the Western world, yet there are much less mishaps surrounding them. “Safety rules are followed and strictly enforced in these countries. Developers are like any kind of businessmen; theirs is to maximise profit. There are the responsible ones and irresponsible ones. They must be guided and overseen by the authorities,” he says. He says there does not seem to be a comprehensive policy and plan here to minimise such incidents. There is no 100% prevention anywhere in the world but a blanket ban is not the solution. “We read about express buses getting involved in accidents and lives are lost. Do we ban all such buses? Let us look at the maintenance of these buses and the drivers behind them. In the same way, let us look at the developers and how they go about building on slopes and how the authorities monitor and maintain these slopes,” he says. Lim says homeowners too need to take action to strengthen the slopes. “Because it costs money, many prefer to live dangerously rather than to spend the money.The authorities know about it and should have taken action to compel the owners to take preventive measures or do it themselves,” he said. Following last week’s incident, Lim expects fear to impact demand and prices. Cost is expected to go up as authorities impose stricter conditions. As homeowners mull over selling out of Bukit Antarabangsa and its vicinity, Lim will buy more as prices drop. “I love the hills and trees. It’ll be value for money,” he quips. MORE prompt and effective government measures are needed to address the many challenges facing the country’s economy and property sector today. The widening impact of the US financial crisis and the gloomy global economic outlook have eroded the people’s confidence to an all-time low. Much wealth has been lost these past few months as stock and commodity prices around the world plunged and the prevailing mood is to conserve as much cash as possible and refrain from buying any big ticket items, including property. As a tangible asset, property remains one of the most viable investment instruments to hedge against inflation. It will certainly help if the Government starts the ball rolling to spur more demand-led growth by making more fiscal expenditure on critical sectors, including development projects with high multiplier effects under the Ninth Malaysia Plan. With the expected prolonged impact of the global crisis on the local economy, industry players have expressed their concern over whether the Government’s RM7bil economic stimulus package is adequate to give a lift to the economy as governments around the world are making much larger commitments to boost their staggering economies. They are urging the Government to spend more and ensure the fast and efficient implementation of critical projects that have huge spillover effects on the other sectors. Given their link to at least 140 other industries, the property and construction sectors have a huge role to play to breathe more life into the local economy. To encourage the 67% to 70% of the local population who still do not own homes to start buying their own property, a RM10,000 grant given out to all first-time house buyers will help ease the people’s burden and inject a much needed boost to the housing sector. Even the Australian and Canadian governments are rewarding their first time home buyers with grants and the measure had proven to be effective in spurring greater buying activities during the present “credit crunch” times. Saturday’s pre-dawn landslide in Bukit Antarabangsa that cost at least four lives and immense damage to property value also needs immediate attention and concrete steps to prevent such mishaps from happening again. The latest disaster has once again cast the spotlight on hillslope developments as residents staying around such projects are rightly worried for their safety and are calling for construction work to be halted immediately. Meanwhile, developers with approved projects and land in those “critical” zones are not about to give up easily as they have invested in the land and gone through the proper channels to seek the authorities’ approvals for their building plans and projects. Rather than adopting “knee jerk” responses to address the situation, industry players want to know why the authorities have yet to draw up a “list of dos and don’ts” involving hill land after the collapse of the Highland Towers in Hulu Kelang 15 years ago. “At least, they should have properly filed records of who are the landowners and developers of projects in the surrounding areas, what is the nature of the soil and other critical information, such as underground water and soil conditions. Regular checks on these areas should have been carried out after the first landslide to avoid other mishaps,” says Real Estate and Housing Developers Association Selangor chairman Datuk FD Iskandar. Since these information are still not available, technical experts should be called in to address these issues and draw up consistent and transparent guidelines governing hillslope land, especially those in the landslide vicinity. And if the Government wants to stop hillslope projects that have been approved by the state authorities from continuing, developers should be compensated accordingly after a valuation exercise is carried out to determine the value of the land. PUTRAJAYA: The Damansara 21 hillside project – deemed a high-risk development by the Government and where two landslips have occurred – has been frozen. The Government has also ordered that the construction of the 34-storey block on Lot PT 21, Persiaran Raja Chulan be halted immediately pending a decision by the Govern­ment. The developer has been told to take measures to prevent soil erosion. Federal Territories Minister Datuk Seri Zulhasnan Rafique announced a temporary halt on structural works for the Damnasara 21 – a multi-million-ringgit bungalow project by Selangor Dredging Bhd (SDB) – but declined to say if the project would be shelved. “The ministry has ordered the developer to continue with slope-strengthening works. The work is due for completion in February,” he told a press conference here yesterday. The project in Damansara Heights, Kuala Lumpur, involves the construction of five-storey luxury bungalows, priced from RM10mil to RM15mil each on 2.3ha of land. The number of units was scaled down from 25 to 21 following strong protests from Medan Damansara residents living adjacent to the site. Stop-work orders were also issued to the developer for flouting safety laws. Zulhasnan declined to comment when asked if the slope gradient for the project was deemed within the unsafe zone. The service apartment block in Bukit Ceylon, Kuala Lumpur, is one of two other high-risk hillside development projects identified by the ministry. The other is the Bukit Gasing bungalow scheme bordering Selangor. Meanwhile, KL City Hall has deferred any decision on the Bukit Gasing bungalow project due to a lawsuit filed by residents. PUTRAJAYA: All hillside projects on Class IV slopes – with gradients above 35° – in Kuala Lumpur, Labuan and Putrajaya have been banned. Federal Territories Minister Datuk Seri Zulhasnan Rafique said all development on Class III slopes – with gradients between 26° and 35° – have been temporarily frozen until a perfect planning, design and monitoring system is put in place and enforced by the Govern- ment. “Developers of ongoing projects will be held responsible for carrying out soil stabilising works and building proper drainage systems to ensure public safety,” he told a press conference here yesterday. Just stop it: Tractors and heavy machinery at work at the site of the Bukit Ceylon apartment project with danger lurking above. Kuala Lumpur City Hall, Putrajaya Corporation and Labuan Corporation have been directed to implement long-term measures like enforcing scheduled checks and establishing a unit to monitor landslide and sinkhole-prone areas. Under Section 85A of the Road, Drainage and Buildings Act 1974 (Act 133) property owners of buildings more than five storeys high with the approval to occupy the premises for more than 10 years are to carry out scheduled checks to ensure they were safe for occupation. “This will first come into force for buildings on hillslopes and former mines,” said Zulhasnan.